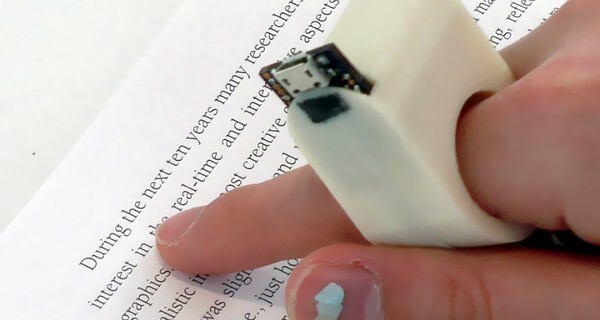 FingerReader is a radical piece of wearable tech that lets visually impaired people read any text they point their finger at, wherever they are, via a miniature camera embedded in a ring. There are 285 million people with sight loss worldwide. While Braille, which was developed in the 19th century and allowed those with visual impairments to read text via a raised dot alphabet, has endured as one of the most profoundly empowering breakthroughs for blindness, over a century later and despite greater accessibility through e-readers, millions of texts remain inaccessible. Just 7% of books are published in large print, unabridged audio or braille, and other printed matter – important topical information you’ll find on the move, such as hospital leaflets, legal documents, reports, menus, street signage – remain largely incomprehensible and certainly impossible to read on the spot. FingerReader, which is not yet commercially available and still in prototype, should change all that. The ring gives an immediate spoken rendering of lines or chunks of any text you run beneath your finger, with pulse points indicating if you’ve strayed off the text’s baseline grid or come to the end of a line. Unlike existing readers, FingerReader is geared up to work outside the home: it reads quickly in new environments, and works with smartphones, not just home computers. ‘Everywhere we go, for folks that are sighted, there are things that inform us about the products we are about to interact with. I want to be able to interact with those same products,’ said 62-year-old visually impaired user Jerry Berrier. The device, which can read text to a minimum font point size of 12, took three years to make, and further applications include translations and pronunciation support with foreign languages.